For Jean-Jacques Bréban, CEO of "Vins Bréban", fine wines are first and foremost a convivial spirit. Rosé wines, white and red will be your companions at pleasant times with family and friends around the table, for your appetizers, picnics and meals. Offering a wide range of styles and flavors, the wines of Provence accompany well most dishes of various cuisines. We invite you to join us in enjoying the French Provence Wines, and choose your favorite recipes presented in our blog. 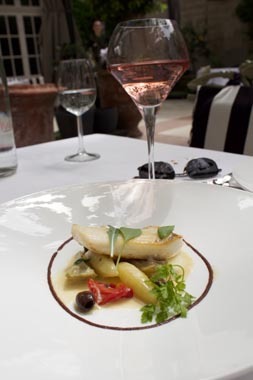 The Domaine la Martelle rosé goes well with the Pike perch and vegetables. Preparation - 20 minutes. Cooking - 35 minutes. Peel the potatoes, place in a medium sauce pan, add water and bring to a boil. Boil the artichokes, as well, then peel them to yield their hearts. Keep the artichoke hearts and potatoes warm. Grill the red pepper for approximately 2 minutes in about 1 tablespoon of olive oil. For the sauce: Mix the lemon juice with the cream, add salt and pepper. Heat the mixture while stirring vigorously. Turn off the heat before reaching a boil, then keep the sauce warm. Cook Pike perch filets 4 minutes on each side in a pan with butter and olive oil. Turn off the heat, sprinkle with lemon sauce and cook under cover for another 4 minutes. Season the Pike perch and vegetables to taste and garnish with young shoots of salad leaves, olives and chopped chives. 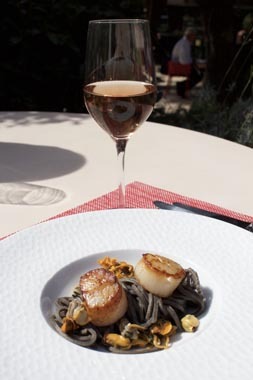 Domaine de Pontfract rosé wine goes well with Saint-Jacques minced scallops and cuttlefish spaghetti. Preparation - 10 minutes, cooking time - about 20 minutes. For 2 persons: 100 g of scallops; 200 g of cuttlefish spaghetti; 2 tablespoons olive oil; 20 g of butter; garlic, salt and pepper to taste. Rinse the scallops under cold running water and dry them with absorbent paper towels. Heat the olive oil and butter in a pan. Add the scallops and cook them for about 2 minutes on each side over high heat. Upon completion of cooking, keep them warm under the cover of the sauce pan. Immerse the cuttlefish spaghetti in boiling salted water and cook 8-10 minutes. They must remain slightly firm. Drain, rinse spaghetti under cold water and drain again. Heat olive oil in a sauce pan and brown for 2 minutes. Chop garlic, salt and pepper to taste. Divide the cuttlefish spaghetti into equal portions, then garnish with cooked scallops. 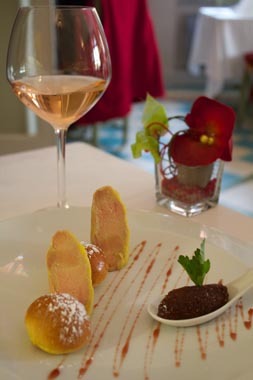 Winter en Provence rosé wine goes well with foie gras with profiteroles and fig jam. To prepare the profiteroles pastry: put the butter, salt and a half cup of water in a saucepan. Bring to a boil and at this time add the sifted flour at one stroke. Mix vigorously with a wooden spoon until a dry ball of dough is coming off the bottom of the pan. Let mixture cool. Butter and flour a baking sheet. Preheat the oven to 180° C.
Stir one fresh raw egg into pastry preparation. Work until the dough is soft and smooth. Let this mixture cool a little, then place small scoops on the baking sheet spaced evenly apart from one other. Place baking sheet in the oven and cook for 20 minutes. Once baked permit the dish to slowly cool by leaving the oven off door slightly ajar. Place foie gras and profiteroles on dessert plates and garnish with fig jam. SPAGHETTI WITH PROVENCAL SAUCE&ROSÉ WINE OF PROVENCE "DOMAINE VALFONT"
Alcohol abuse is dangerous for your health, so please consume such substances with moderation.